Citizens for Milford is continuing its partnership with the Milford Corps of the Salvation Army to expand the DRAPER MEMORIAL PARK FIELD OF FLAGS, a tribute acknowledging the service and sacrifice of our veterans and active military personnel with a display of American flags to be placed in Draper Memorial Park on five patriotic holidays each year. The next display will be installed this Veterans Day. All area citizens, organizations, and businesses are invited to sponsor a 3′ x 5′ American flag to fly on a 10′ staff in Draper Memorial Park for a $60 donation. Each flag will include a yellow ribbon with an attached card naming the person being honored, the honoree’s military branch and years of service, and the sponsor’s name. Sponsors can choose to honor a veteran (alive or deceased), an active member of the military, or all our nation’s veterans. Previous sponsors are encouraged to renew their flag sponsorship for another year. The $60 donation sponsors a flag in Draper Park for all five of the following patriotic holidays: Veterans Day 2017 and Memorial Day, Flag Day, Fourth of July, and Labor Day 2018. 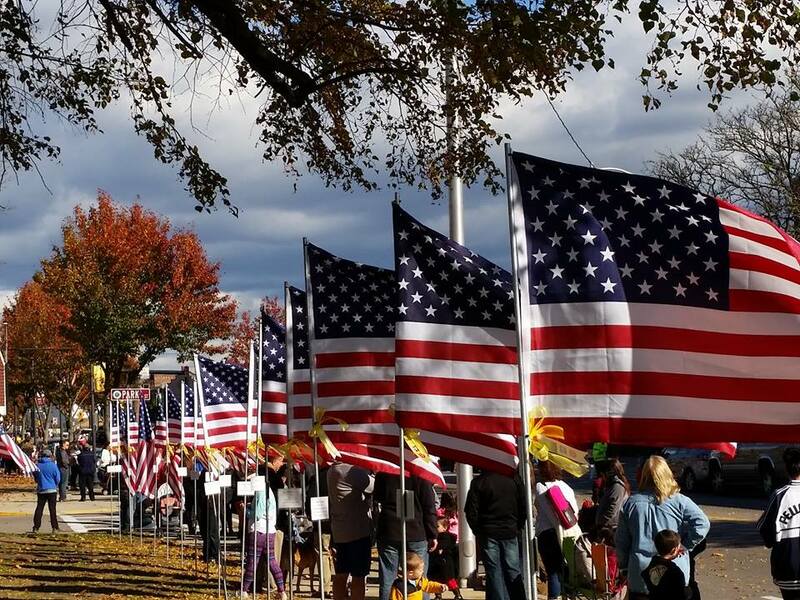 To sponsor a flag for the “Draper Memorial Park Field of Flags” project, citizens need to download and complete this form and mail it to the address provided on the form with a $60 check made out to the Salvation Army before November 3. Anyone who is renewing a flag sponsorship can simply mail the check without the form as long as the sponsorship information has not changed. 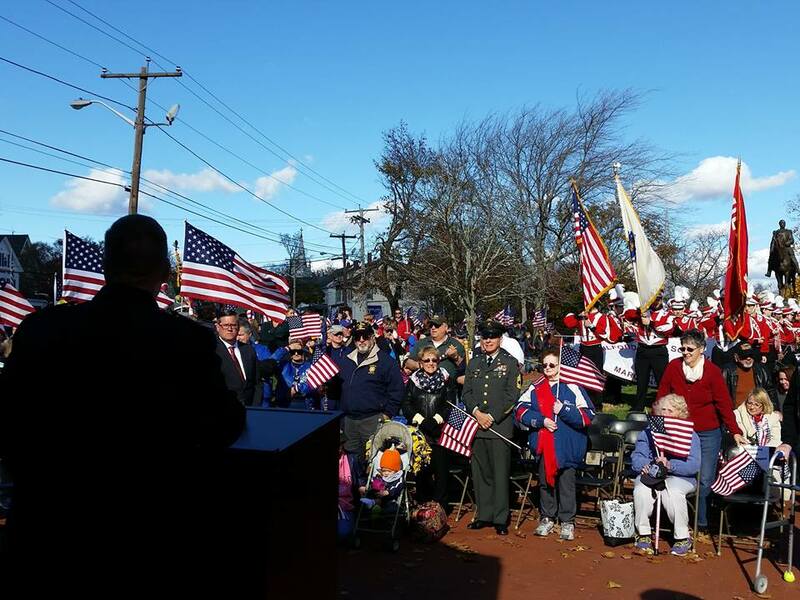 All area residents are invited to join us for the annual Veterans Day Parade on Friday, November 10 and to attend the Field of Flags Dedication Ceremony, which will immediately follow the parade in Draper Memorial Park. Citizens for Milford anticipates the ceremony will begin at approximately 11:00 a.m. For the first time, the ceremony will feature the distribution of Medals of Liberty to the families of eight Milford residents who were killed in action. Another new highlight this year will be the Missing Man Table remembrance ceremony, which honors military members missing in action. Music will be performed by the Milford High School Band. If the parade is cancelled due to rain, the Medals of Liberty Distribution and Missing Man Table ceremonies will be held in the Italian-American Veterans Club, located at 4 Hayward Field. Draper Memorial Park occupies a triangle of land in the downtown Milford area, located at the intersection of Congress Street and Main Street. The park features monuments that list the names of veterans who served during World War II, the Korean War, and the Vietnam War. Standing tall in the park is the statue of General William Franklin Draper by sculptor Daniel Chester French, whose work also includes the massive marble statue of Abraham Lincoln in the Lincoln Memorial in Washington, D.C. The care and management of Draper Memorial Park falls under the authority of the Milford Parks Commission and Milford Veterans Services. Citizens for Milford is grateful for both office’s enthusiastic support for this project. For more details about the Field of Flags, click here. Meet us at the municipal parking lot across from Sacred Heart Church from 9:00 a.m. to 1:00 p.m. to help us make a clean sweep of Milford! To sign up to receive email updates regarding our news and events, please click here.